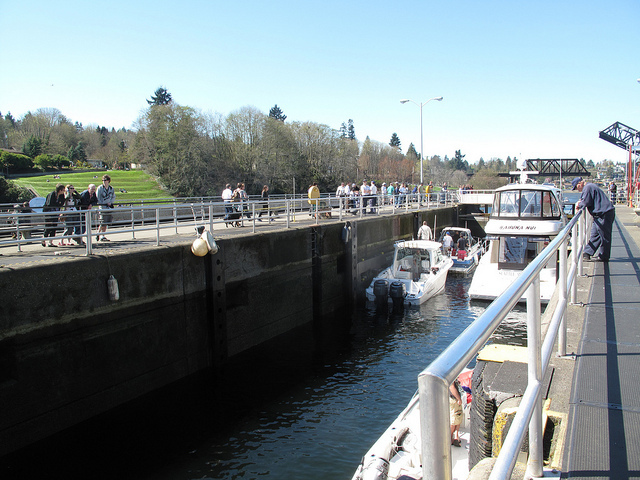 It was a lovely day at the Lake Washington Ship Canal and Hiram M. Chittenden Locks (the Ballard Locks) at 3015 NW 54th Street, Seattle, WA 98107. 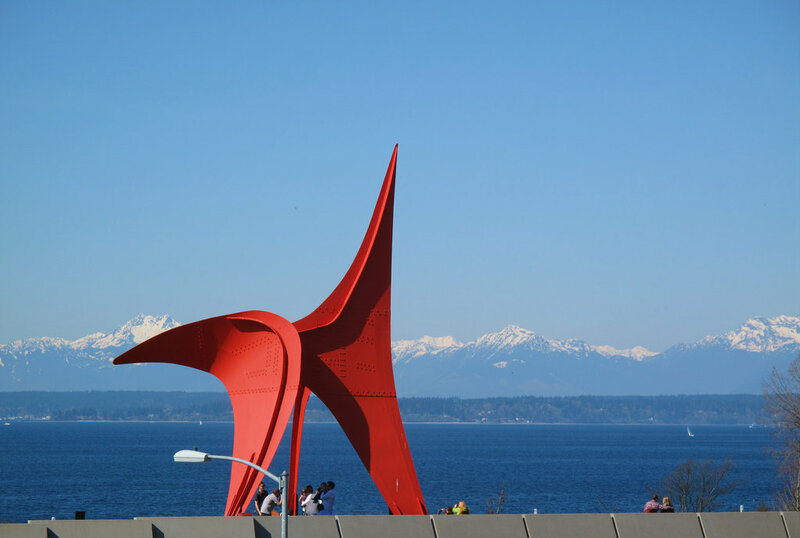 Dear daughter and her dear friend had one last day at their Seattle conference and I had time again to explore Seattle. 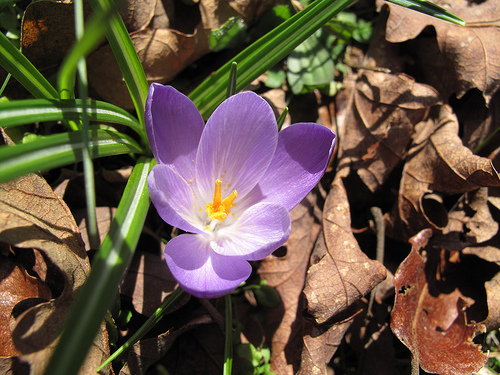 I got wildly lost getting there (darned that GPS woman!) and ended up on the wrong side, but that was just fine since there was ready parking and it gave me more of a chance to stretch my legs. I went down to see the fish viewing area and saw two little bitty salmon swimming gamely along. The causeway over the spillway connects the two sides of the locks and is an invigorating, misty walk. Then on the other side is the visitor’s center and gardens. 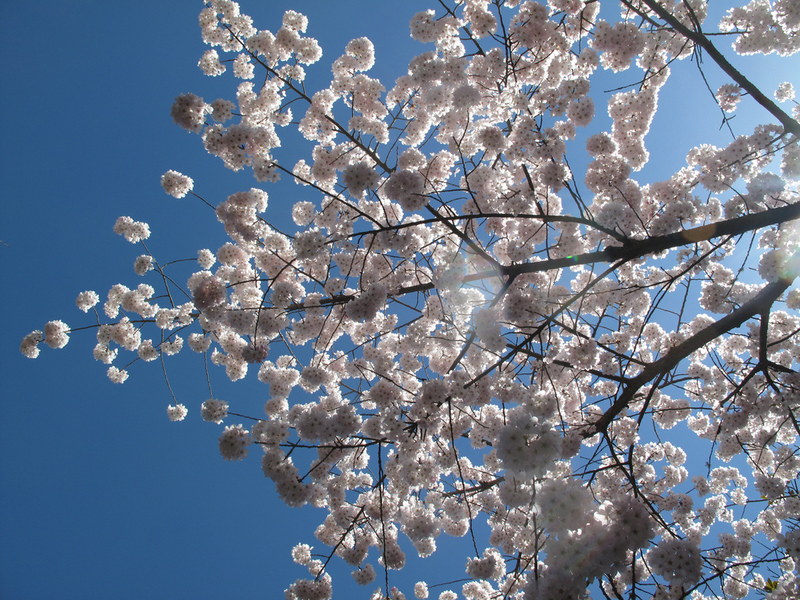 I walked on through the park to the fish and chips place right outside the gate, then with lunch in hand I returned to a sunny bench in the park for an alfresco lunch. 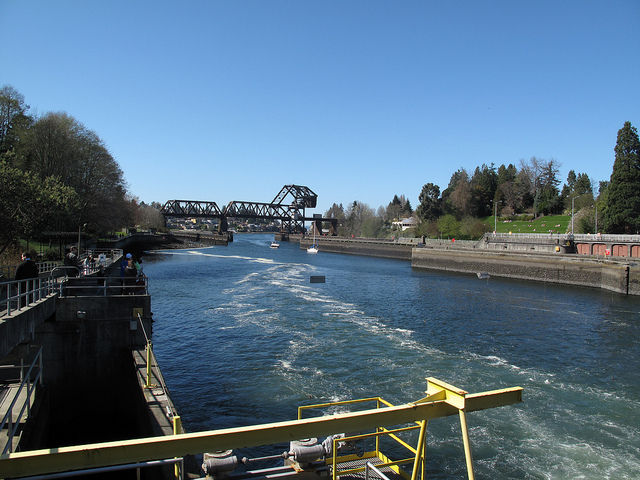 The ship canal was built in 1917 and connects Lake Washington, Lake Union, and Salmon Bay to the Puget Sound. While I was there, it was mostly pleasure boats. 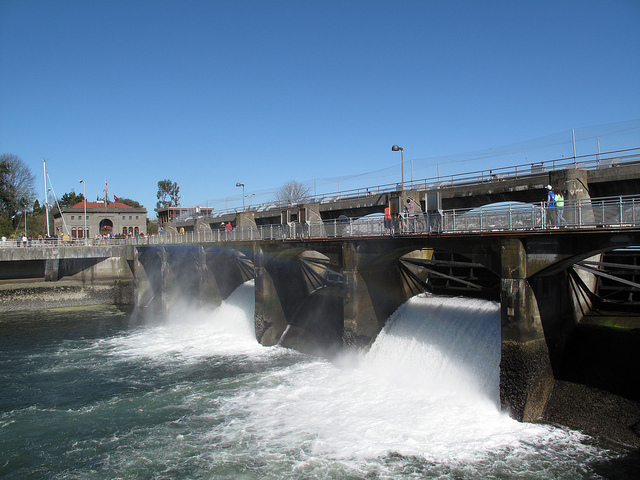 The locks were added to the National Register of Historic Places in 1978. 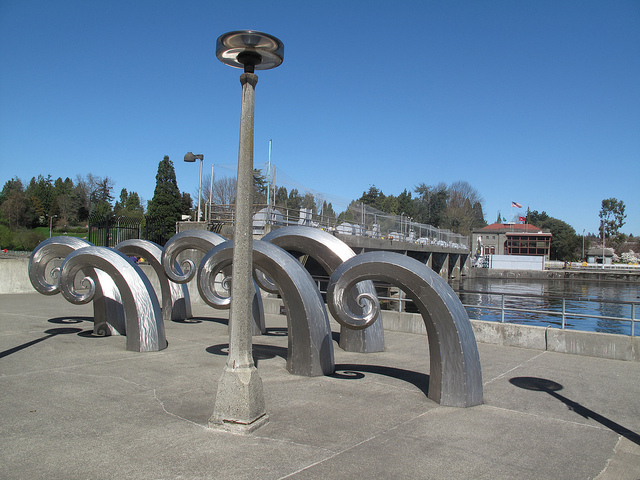 There is a wonderful sculpture at the locks named Salmon Waves by Paul Sorey. This entry was posted in Art -- there is art here!, Community Space, Parks, Seattle, WA State - King County and tagged Ballard Locks, boats, causeway, Hiram M. Chittenden, Lake Union, Lake Washington, Lake Washington Ship Canel, Locks, Paul Sorey, salmon, Salmon Bay, Salmon Waves, Seattle, ship canal, spillway on March 31, 2013 by admin. 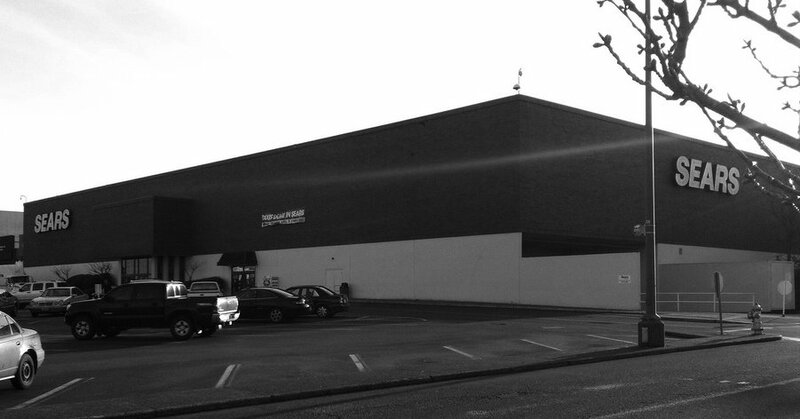 Sears is located at the Tacoma Mall at 4502 S Steele St #100, Tacoma. Information about Sears is here. 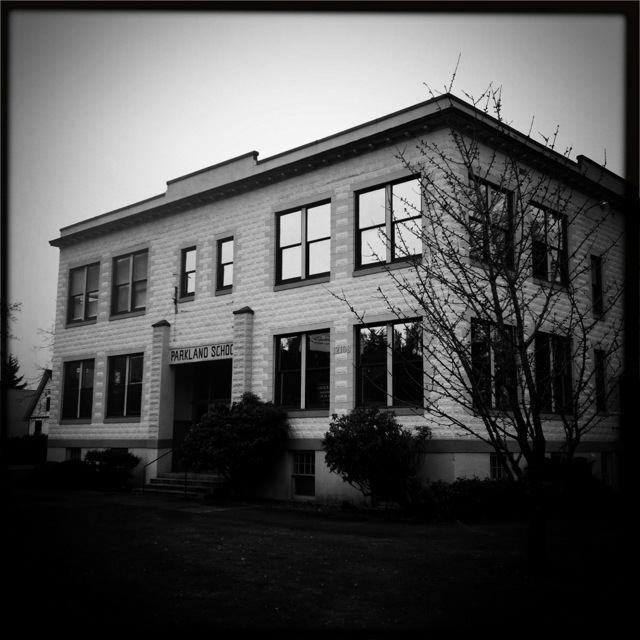 Tacoma Public Library’s Northwest Room says that the mall’s original four anchors were J.C. Penney, the Bon Marche, Nordstrom and Rhodes Department Store. I was a little surprised that Sears wasn’t on the list. 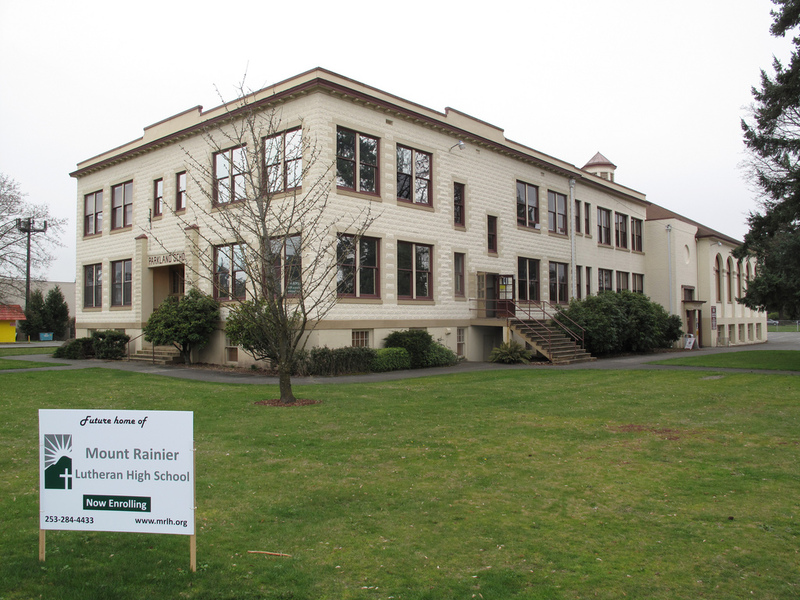 The Bon was Tacoma Mall’s first tenant. Tacoma Public Library has a wonderful photo of Tacoma’s original Sears at the corner of South 13th Street and Broadway circa 1950. It can be seen here. This entry was posted in Chain stores (there are a bunch of them), Stores and other places that sell you things, Tacoma, WA State - Pierce County and tagged mall, retail, Sears, shopping, Tacoma, Tacoma Mall on March 28, 2013 by admin. 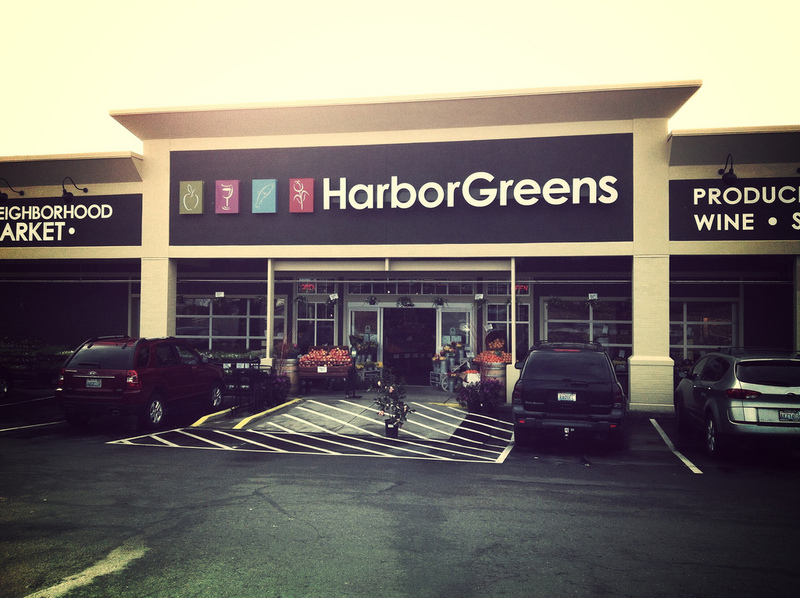 Harbor Greens at 2620 Bridgeport Way W. University Place WA 98466 opened on March 1, 2013. 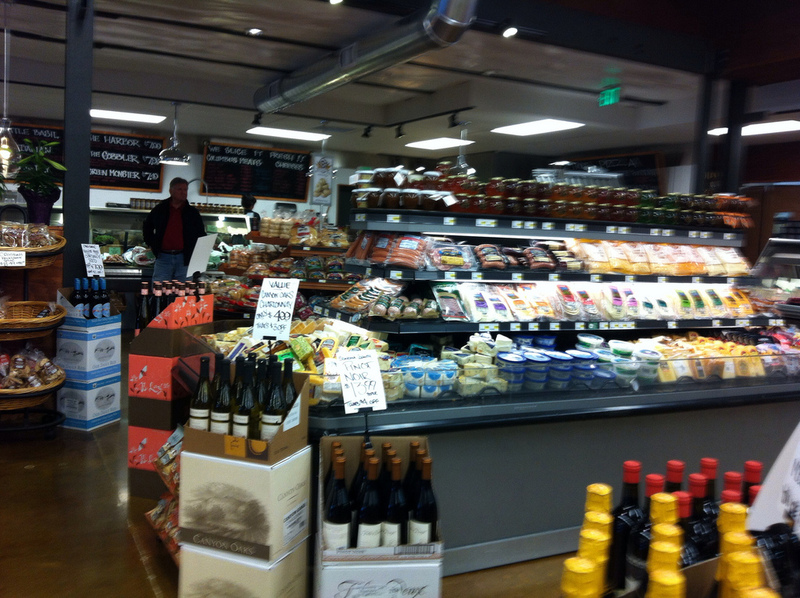 Really, its delightful store full of fresh, lovely produce and a great deli. 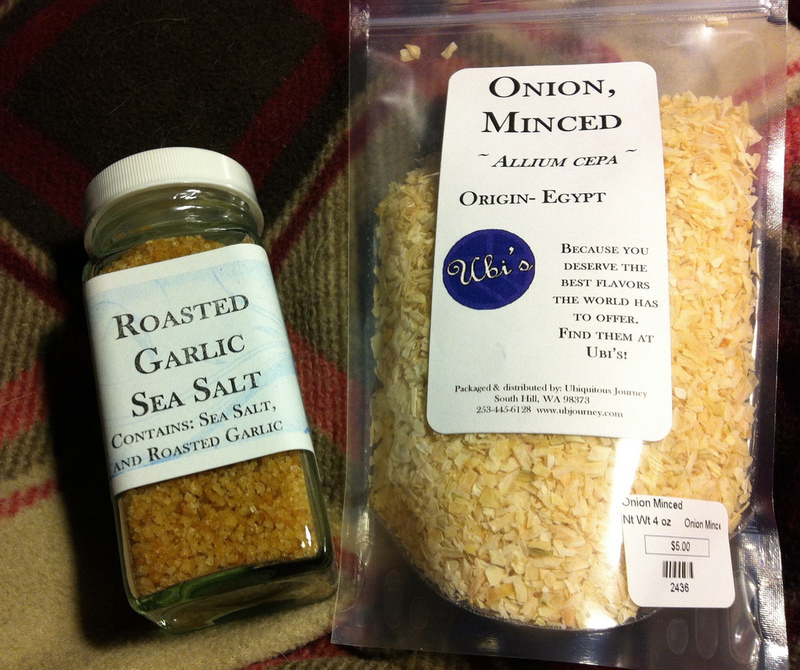 There is also a large wine/beer selection, interesting candy, flowers/gardening supplies and sundry items. Oh, and the people working there were really nice! 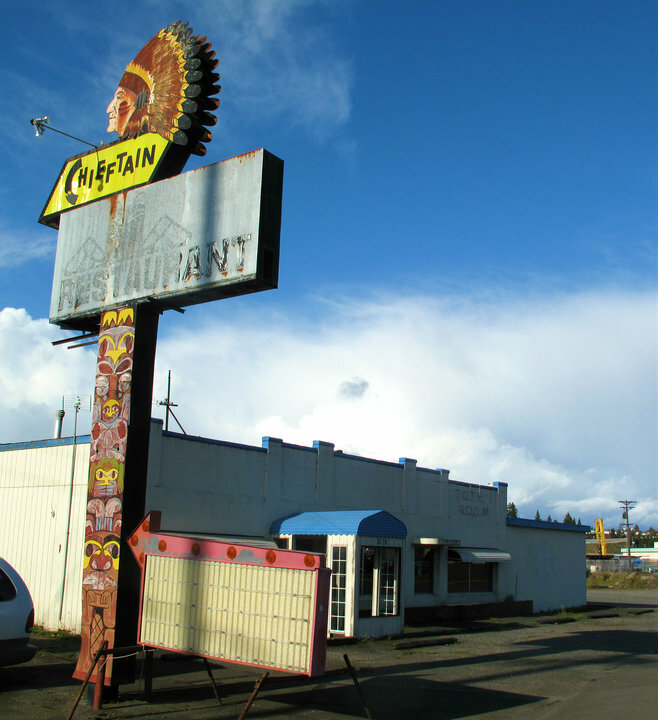 The original location is in Gig Harbor. Their Facebook page is here and their website is here. 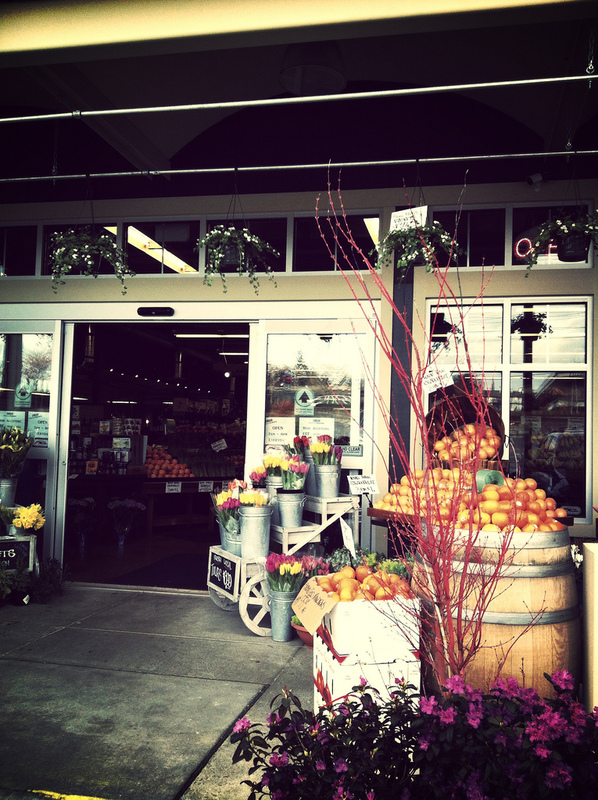 This entry was posted in Stores and other places that sell you things, Unique Shopping (stores with some personality), University Place, WA State - Pierce County and tagged candy, deli, food, grocery, Harbor Greens, produce, store, University Place on March 27, 2013 by admin. 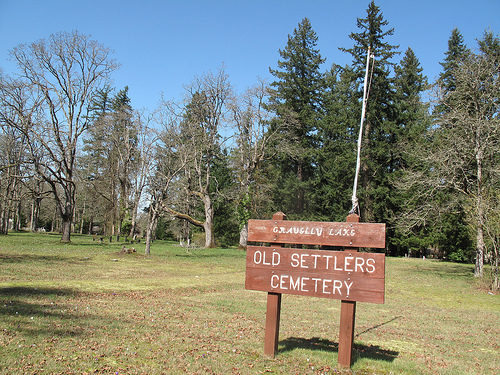 The Old Settler’s Cemetery is located at the Northeast corner of Washington Boulevard SW and 83rd Avenue SW in Lakewood. The almost 5 acres site is partially tree covered with paths leading through the graves. A variety of headstones are there including those flush with the ground, old marble, new marble and wooden. It appears that several of the grave sites are no longer marked. 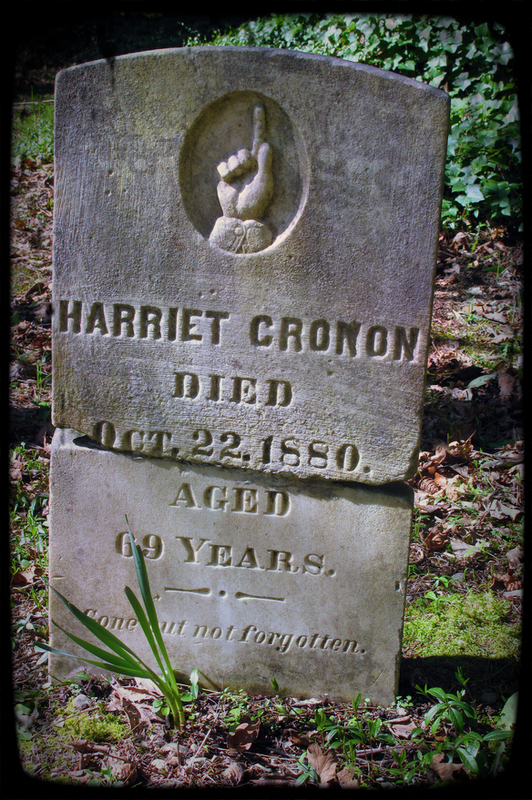 Burials began at the site in 1855 for pioneers and their descendents. 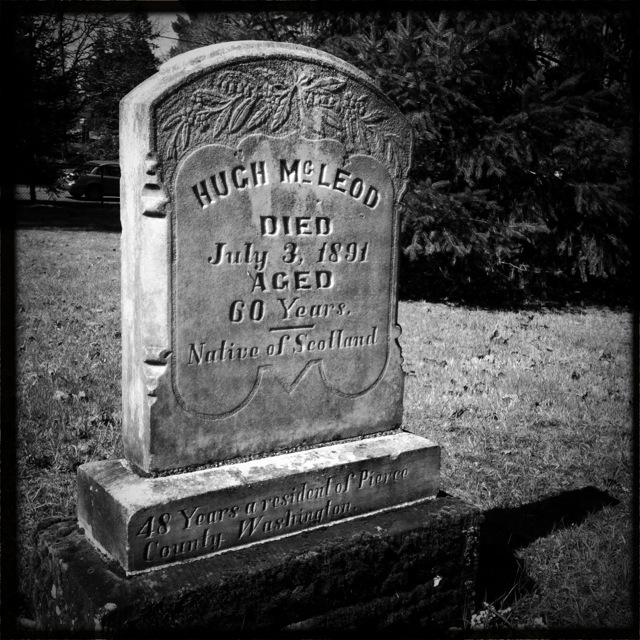 The first headstone I came to belong to Hugh McLeod who died on July 3, 1891 at age 60. His stone stated that he was a native of Scotland. The most recent burial that I’m aware of was in 1988. 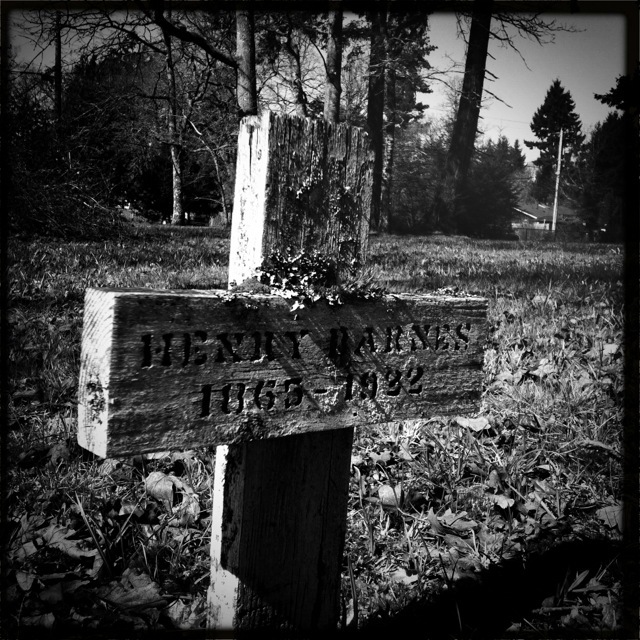 This entry was posted in Cemetery, Lakewood, Places of the Spirit, WA State - Pierce County and tagged Church, crocus, crocuses, graves, headstones, James Holt, Lakewood, old, Old Settler's Cemetery, Pierce Co., Seattlers, Settler, Settler's, WA State - Pierce County on March 23, 2013 by admin. 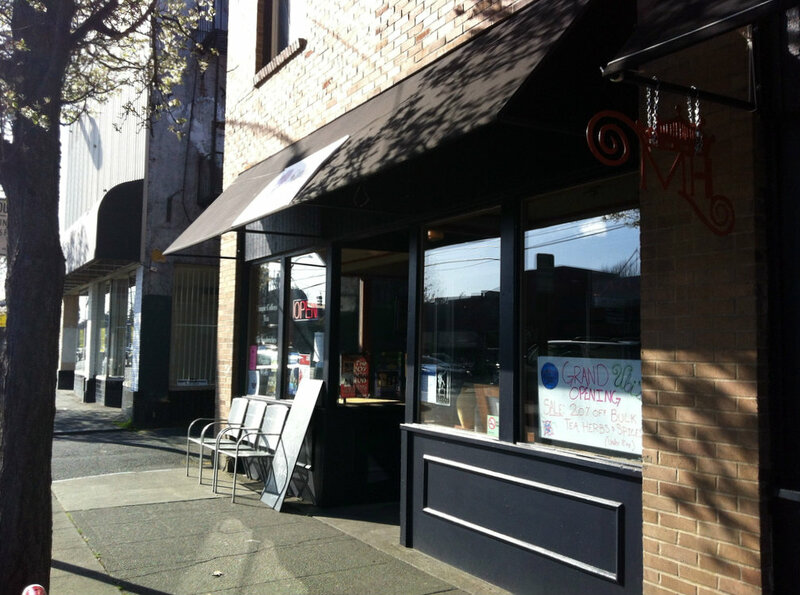 Lunch today was at Round Table Pizza at 2601 North Pearl, Tacoma. The pizza was good and the company even better. 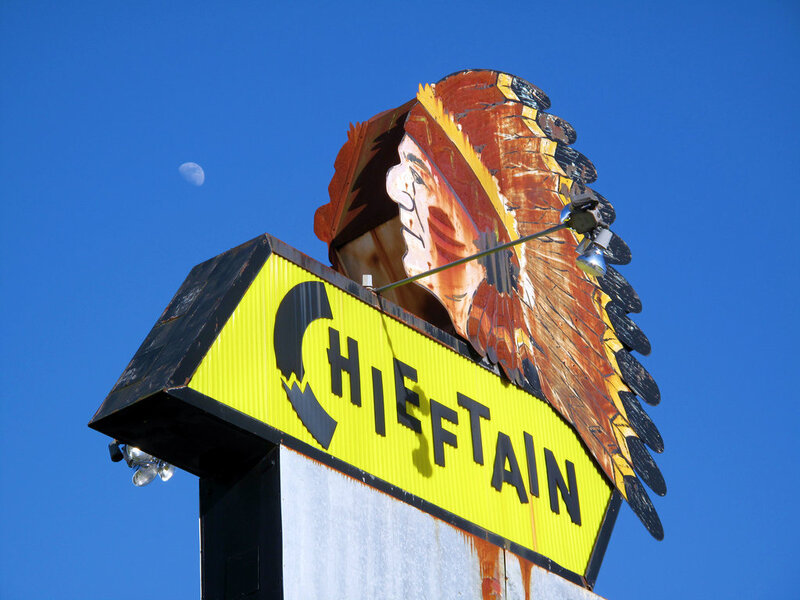 The company was founded in 1959 and there are over 500 locations in Western United States. 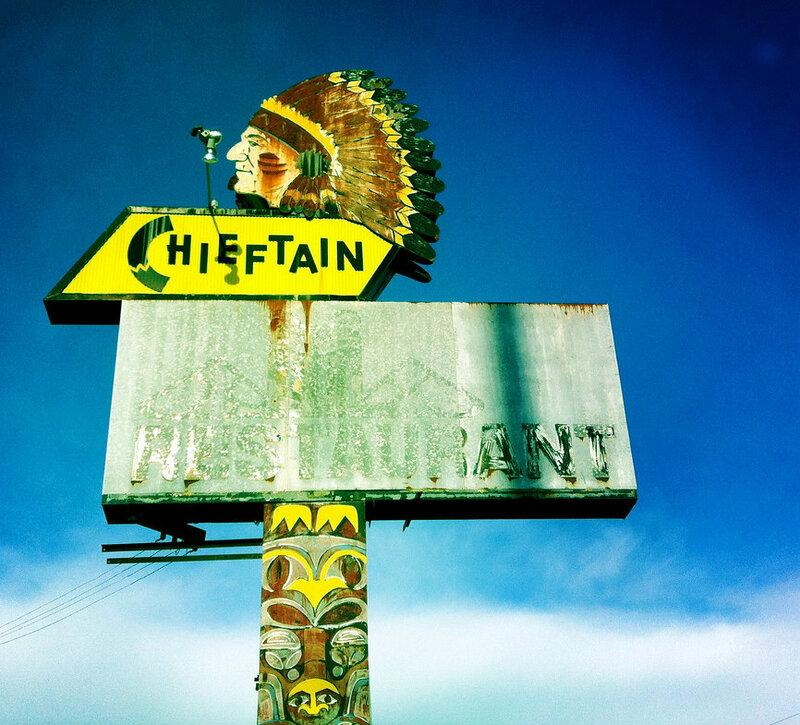 This entry was posted in Restaurants, Sit Down Establishments, Tacoma, WA State - Pierce County on March 17, 2013 by admin. 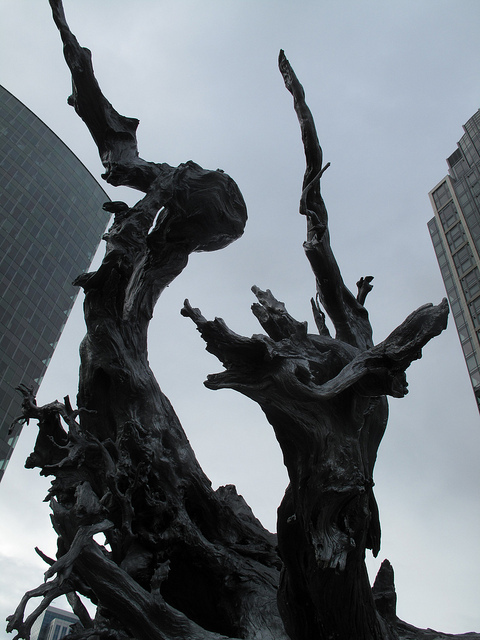 Silver Root in front of Bellevue’s City Hall is one of the most wonderful sculptures that I’ve seen in a long time. 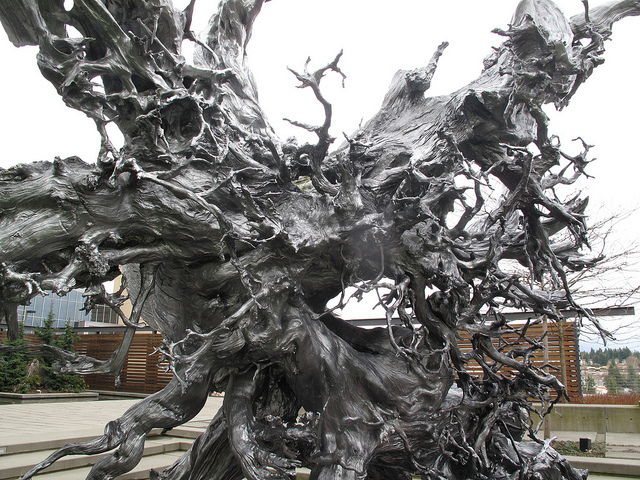 It is an old cedar root harvested in the 1800s, then cast in bronze and plated in silver. It seems as though the piece is having a small technical problem with the reflecting pool not full and orange cones where the recessed lighting is. Dan Corson is the sculptor. 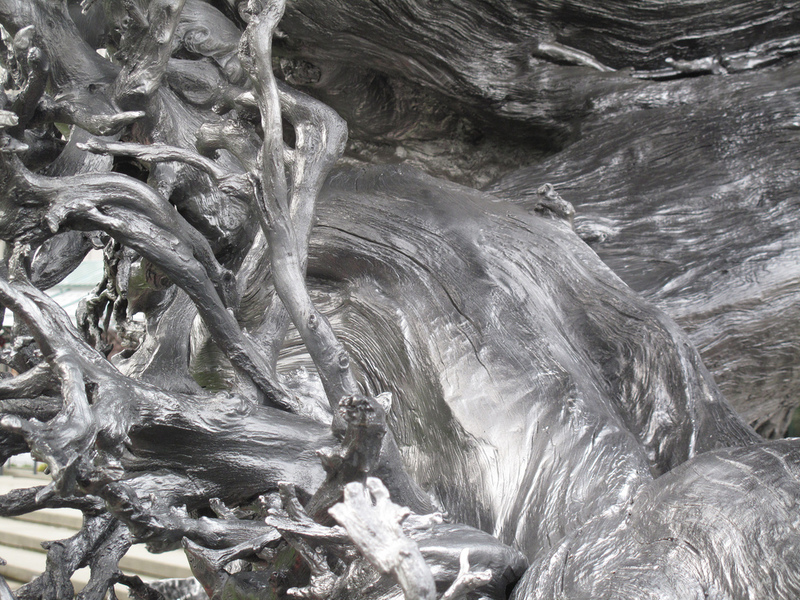 His website is here http://dancorson.com/root and shows the sculpture in an intact pool. 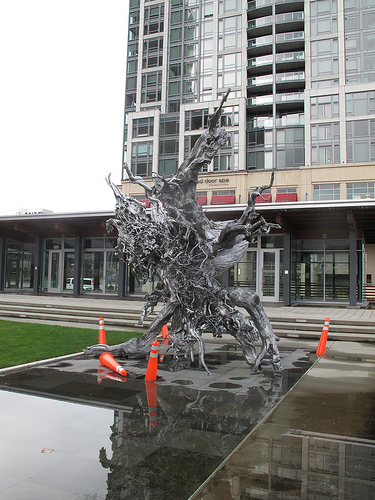 This entry was posted in Art -- there is art here!, Bellevue, WA State - King County and tagged art, Bellevue, cedar, city hall, Dan Corson, pool, reflecting, sculpture, scultor, Silver Root, urban on March 16, 2013 by admin.